There are a lot of hills in Middle Tennessee. Going up them requires you to keep your engine and transmission working well if you want to make it to the top of the hill. Getting to the top of the hill IS important but that's not what we are talking about on this page. We are here to talk about how to stop a car or truck that weighs a few thousand pounds when it is sizzling down a large hill or mountain. Hendersonville, Tennessee is a small town where plenty of people do a lot of their own repairs. One of the things that always makes us laugh is when people who tell us that they do very little work on their own cars also tell us, "I don't work on cars but I do all my own brake work though". 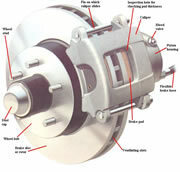 The braking system is the most important system on any car or truck. This is why car and truck manufacturers started using technology developed for airplanes called disc brakes. Disc brakes were originally designed to stop airplanes but it didn't take very long before automotive engineers starting using them on cars. Disc brakes are actually simpler in design than drum brakes. The disc brake system receives hydraulic pressure from the master cylinder and uses this pressure to expand the piston or pistons on the disc brake caliper. The fact that the system looks so simple has made a lot of people who know nothing about cars do their own brakes. Remember the brakes STOP THE CAR, (at least the good ones do). A lot of cars come in with brake calipers that have been damaged by people prying the pistons back into the calipers without using the correct tools. The hydraulic fluid presses the piston out if it's bore very evenly. When pushing the piston back in you need to make sure you use the correct tools to push it back in evenly or you will scratch the piston or the bore of the caliper or both. Hendersonville Muffler Company has repaired thousands of braking systems in Hendersonville, Tennessee since their opening. We have all of the tools and experienced, trained technicians to make sure your disc brakes are installed correctly and perform correctly when we are finished with the repair. We use the proper lubricants when replacing disc brake pads. (ALL brakes need to be lubricated!) When servicing anti- lock braking systems special procedures must be followed. All modern cars use anti-lock brakes as they are required by law on all vehicles sold after 2007 but they have been on most cars longer than that. Don't take chances with your safety. Have your brake system repaired by the experts art Hendersonville Muffler Company. We will do the job correctly. We charge fair prices for brake repairs. We do it right and we will make sure your car or truck stops correctly before it leaves the shop. One more point worth mentioning is that if we see a lot of bad repairs done on disc brake systems you should read this section on drum brakes because the bad things inexperienced mechanics do to drum brakes are much more common. For proper disc brake repair in Hendersonville, Tennessee choose Hendersonville Muffler Company and you will stop as when you should.